Those of you who grew up in the late 70s and early 80s will find Pixel Galaxy familiar territory, both in gameplay and presentation. At times it can get a tad overwhelming, but that’s why they call it the “bullet hell” genre. The big twist in Pixel Galaxy that separates it from similar games is the fact that your initial ship, for lack of a better term, can’t actually fire any weapons or attack enemies. 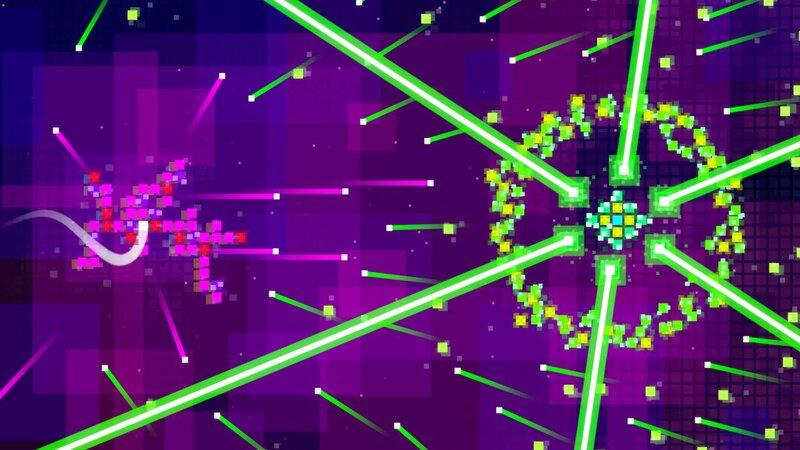 Rather, your tiny little pixel recruits other multi-coloured blocks to do the shooting for you. Each pixel you add to your own increases the size, and shape, of your ever-growing ship and continues to fire the attack pattern it started with it—all without your intervention. The pixels’ firing patterns differ in their form, like upgrading weapons in similar shooters in this genre. The variation is useful (or not) depending on how you utilize it. Now if this sounds a bit passive, it should. Not being in charge of when and where you’re firing can get a little boring after a while. Moving around the screen dodging the endless attacks is about all you can do, allowing your new buddies to do the attacking for you. There is a bit of strategy at play however, in that you decide the shape your ship takes as it grows ever larger, and you have the ability to rotate your ship à la Tetris. Make a big giant line and you’ll have a good cover spread of firing power, but it becomes harder and harder to successfully dodge enemy attacks. Make a big ball shaped lump and you gain some freedom, but lose out on any advantage the rotation offers. The game features six difficulties, which by the end can become incredibly overwhelming, even for veterans of the genre. One shot to your original starting pixel and you’re done for. Which makes it all the more important to tread the fine line between hulking tank and small but agile shape. The graphics are lovely, and the game blasts you with bright neon colours that pulse along wonderfully with the snappy and energetic soundtrack. There isn’t a whole lot of variety in the visuals, after all, everything is just pixels, but that’s clearly the aesthetic the developers were aiming for. 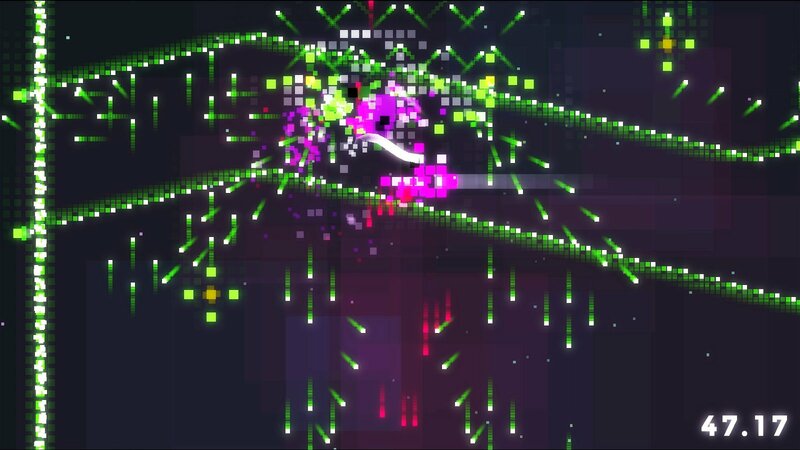 After a while though, the pretty colours and blocks do eventually start to strain the eyes, especially in the later levels when the screen is just a chaotic mess of screaming rainbow pixels. This game isn’t for everybody, and even fans of the genre won’t find a hell of a lot of depth to the game. The idea of building your ship as you play and learning how to adapt to that is a nifty mechanic for a game, but doesn’t add a lot of longevity outside the initial learning curve. I can’t help but feel this game would be better off in arcade form, with a properly greased joystick adding a more tactile experience than a gamepad or keyboard. It’s easy to picture a Pixel Galaxy box standing in a mass of blinking lights and booming sound effects as you pump quarter after quarter into it, but playing it on a laptop at home just isn’t the same experience. The big twist in Pixel Galaxy that separates it from similar games is the fact that your initial ship, for lack of a better term, can’t actually fire any weapons or attack enemies.